Glisten, the Machine Cleaning Experts, offers appliance cleaning solutions that make it easy to clean, freshen and maintain your appliances. This twin pack includes two powerful, safe and effective cleaners. Glisten Dishwasher Magic, the only EPA registered cleaner and disinfectant, intensely removes limescale, rust, grease, and other build-up that affects your dishwasher's cleaning effectiveness over time. Unlike other machine cleaners, Glisten cleans, disinfects and removes germs from even the hidden areas. 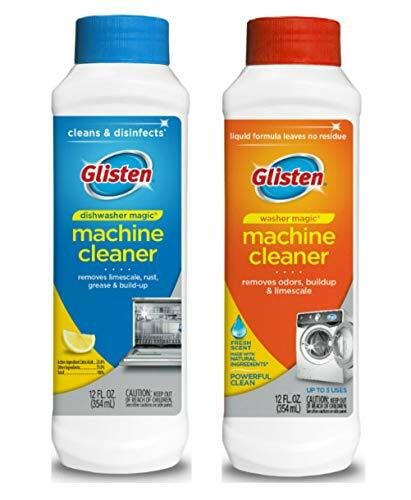 Glisten Washer Magic powerfully removes abrasive hardwater and detergent build-up and eliminates odor-causing residue that reduces cleaning effectiveness and can damage fabrics. Washer Magic, a Safer Choice certified product, safely works in all machines, including hE and contains no bleach to harm the machine or fabrics. The easy to use versatile liquid formula cleans and deodorizes the entire machine, including door seal, detergent drawer and other hidden and hard to clean machine surfaces. Regular Glisten use, keeps your machines clean, fresh and maintained which maximizes the cleaning performance and extends the machine lifespan. A family owned business that started in 1958, Summit Brands offers highly effective, sustainable, and innovative household cleaning products. Summit Brands began with the distribution of multi-purpose rust stain remover, Iron Out, and has since branched out to include a broader line of specialty cleaning products under the OUT, Glisten and Plink brands. As category leaders in many consumer segments, our goal is to provide high-quality cleaning products that fit the needs of the consumer with guaranteed results.